Fans of *NSYNC will have another opportunity to rejoice and relive the legacy of the evergreen mega-group through a nostalgic and immersive *NSYNC-centric Pop-Up experience that is scheduled to run from April 28-May 1 in Los Angeles. The "Dirty Pop-Up" will celebrate the 20 year history of the group and will serve as the launch of *NSYNC's official merchandise capsule collection. The celebration also ties in with *NSYNC receiving its star on the Hollywood Walk of Fame on April 30. *NSYNC "Dirty Pop-Up" Experience, featuring a limited inventory of official merchandise, launches on April 28-May 1 in Hollywood, CA. *NSYNC, in collaboration with merchandise and licensing partner Epic Rights, will launch the *NSYNC Dirty Pop-Up Experience in Los Angeles, CA from April 28-May 1. With free admission, visitors will have first dibs to a limited inventory of official merchandise as well as immerse themselves in fun, engaging photo activations that pay homage to iconic visuals from the group's career. The new line of high-quality branded apparel and accessories will also be available online as of April 30. 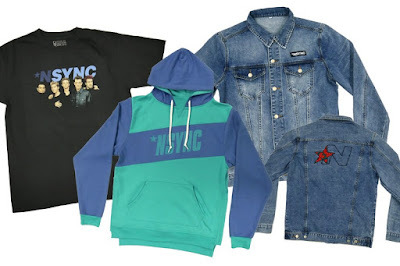 In collaboration with *NSYNC's merchandise and licensing partner, Epic Rights, visitors can expect to have first dibs on a limited inventory of official merchandise as well as immerse themselves in fun, engaging photo activations that pay homage to iconic visuals from the group's career. The experience will also feature authentic props, wardrobe, artwork and photography on display. Admission to the Pop-Up will be free to the public. The new line of high-quality branded apparel and accessories will also be made available online as of April 30. The experience will be open at Cinematic Pictures located across from SWEET! at the Hollywood & Highland Center, 6801 Hollywood Blvd Ste 200A, Hollywood, CA 90028 from 12:00 p.m.-8:00 p.m. on April 28, 29, and May 1, and from 4:00 p.m.-9:00 p.m. on April 30. For more information, visit NSYNC.com. April 28 – noon to 8 p.m.
April 29 – noon to 8 p.m.
April 30 – 4 p.m. to 9 p.m.
May 1 – noon to 8 p.m.